Thunderstorms directly over two of the world’s busiest shipping lanes are more intense than storms in other areas of the ocean. A new study offers a theory. Katrina Virts was looking at data from the World Wide Lightning Location Network, a network of sensors that tracks global lightning, and noticed it almost right away: a peculiar line of lightning strikes that stretched nearly straight across the Indian Ocean. 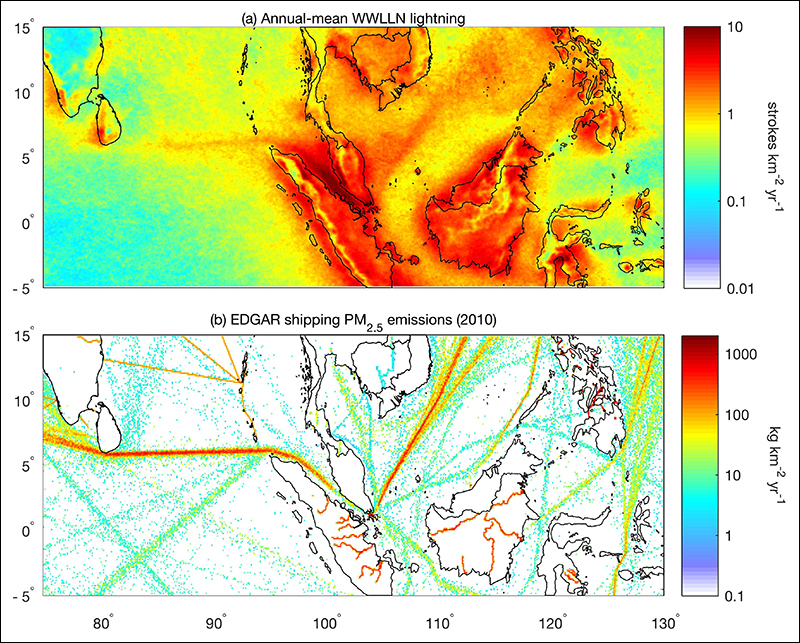 Testing a theory, she and her colleagues at NASA’s Marshall Space Flight Center in Huntsville, Alabama, compared the lightning map to maps of exhaust plumes from a global database of ship emissions, and found a shocking correlation: Thunderstorms above two of the world’s busiest shipping lanes seemed significantly more powerful than storms in other areas of the ocean. In a new paper that tries to understand how this works, Virts and a team of other atmospheric scientists looked more closely. They studied the locations of 1.5 billion lightning strikes from 2005 to 2016, and found nearly twice as many strikes on average over the major routes ships take across the northern Indian Ocean, through the Strait of Malacca and into the South China Sea, compared to adjacent areas of the ocean with similar climates. Because the areas of increased lightning are far wider than the shipping lanes themselves, the researchers say the effect probably isn’t due to bolts striking ships directly. The increase in lightning also “cannot be explained by meteorological factors, such as winds or the temperature structure of the atmosphere,” they write. Where the atmosphere has few aerosol particles–over the ocean, for instance–water molecules have fewer particles to condense around, so cloud droplets are large. When more aerosols are added to the air, like from ship exhaust, water molecules have more particles to collect around. More cloud droplets form, but they are smaller. Being lighter, these smaller droplets travel higher into the atmosphere and more of them reach the freezing line, creating more ice, which creates more lightning. Storm clouds become electrified when ice particles collide with each other and with unfrozen droplets in the cloud. Lightning is the atmosphere’s way of neutralizing that built-up electric charge. A map of ships crossing the Indian Ocean and surrounding seas during June 2012. Aerosol particle emissions in these shipping lanes are 10 times or more greater than in other shipping lanes in the region, and are among the largest globally. Credit: Shipmap.org / Kiln for University College London’s Energy Institute. Thornton notes that ships burn dirtier fuels in the open ocean away from port, spewing more aerosols and creating even more lightning. One upside to this nearly continuous trail of shipping exhaust: Scientists hoping to better understand how aerosols affect cloud formation now have another place to focus their attention (not to mention more fodder for understanding and debating humans’ impact on the climate). It’s thought that the global shipping industry sends more than $5 trillion of goods through the South China Sea every year, and that nearly 100,000 ships pass through the Strait of Malacca alone. Most ships crossing the northern Indian Ocean follow a narrow, almost straight track between Sri Lanka and the island of Sumatra. East of Sumatra, ships travel southeast through the Strait of Malacca, around Singapore and northeast across the South China Sea. Humans, naturally, have been making it rain for a while now. An early ancestor of the geoengineering technologies some are pushing as a way to counter the effects of climate change, rainmaking was developed in part by Kurt Vonnegut’s brother Bernard in the 1940s in order to help farmers with drought-plagued croplands. The technique is still used to seed clouds, especially in China, where the government reportedly spends hundreds of millions on billions of tons of artificial rain a year (the blue skies that follow a government-ordered storm are often spectacular). And researchers at places like NASA use large lightning rods in order to trigger lightning and protect rocket launches, for instance. The new shipping study is another reminder that we’re also capable of changing the weather by accident, in ways we don’t totally understand and often without even realizing it. It’s also a reminder that starting to realize it can be as simple, sort of, as comparing a couple of maps and asking a few questions.